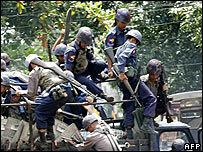 The UN Security Council has urged Burma's ruling junta to show restraint amid a worsening political crisis. After an emergency session, it also called on Burma's generals to allow a special UN envoy into the country. The US and European Union wanted the council to consider imposing sanctions - but that was rejected by China. Burmese authorities confirmed one death on Wednesday as police clashed with protesters in Rangoon. There were reports of at least two other deaths. US President George W Bush has already announced a tightening of US economic sanctions against Burma. But China's UN ambassador, Wang Guangya, said that sanctions against Burma's military rulers would not be "helpful". China and Russia have argued that the situation in Burma is a purely internal matter. Both vetoed a UN resolution critical of Burma's rulers last January. Experts say the hope remains that China - a permanent member of the council and a key importer of Burmese energy resources - may use its powerful influence behind the scenes to persuade the regime to show restraint. The G8, the world's eight most industrialised countries, warned Burma's ruling generals that they would be held accountable for their actions but stopped short of calling for sanctions. The confrontation in Burma has become a battle of wills between the country's two most powerful institutions, the military and the monkhood, and the outcome is still unclear, the BBC's South East Asia correspondent, Jonathan Head, says. A clampdown on the media by Burma's military government - which has banned gatherings of five people or more in addition to imposing a curfew - has made following the exact course of the protests difficult. It is known that on Wednesday thousands of monks and opposition activists moved away from Shwedagon pagoda, heading for Sule pagoda in the city centre. Others headed for the home of detained opposition leader Aung San Suu Kyi. Reports suggested they were prevented from reaching it but other demonstrators did gather at Sule to jeer soldiers. Troops responded by firing tear gas and live rounds over the protesters' heads - for the first time since protests began nine days ago. Monks marching to the home of Aung San Suu Kyi reportedly urged civilians not to join them and not to resort to violence. 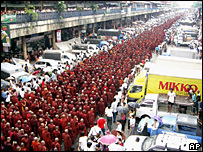 But elsewhere witnesses said civilians were shielding the marching monks by forming a human chain around them. The Burmese state radio station, Radio Myanmar, reported that one person had been killed and three others injured - the first official confirmation that the violence had caused casualties. Earlier, a hospital source in Rangoon told the BBC that the monks were beaten with rifle butts, and that taxi drivers had transported the injured to nearby medical facilities. How will the junta respond? There were unconfirmed reports of at least three deaths on Wednesday, including a civilian, and two monks who were killed near the Shwedagon pagoda. State radio spoke only of one death. Our correspondent says that for all their brutality, the security forces were clumsy. They failed to prevent demonstrators from making their way through the city and their attacks on the monks only inflamed public anger - none of which was reflected on state television. Large demonstrations also took place in the cities of Mandalay and Sitwei, but the security forces there reportedly did little to prevent them. The protests were triggered by the government's decision to double the price of fuel last month, hitting people hard in the impoverished nation. Are you in Burma? How have you been affected by the current situation? What is the mood like in the country? Send us your comments and experiences. You can send pictures and video to: yourpics@bbc.co.uk or to send via MMS please dial +447725100100.